PetGiftBox is a subscription box for both dogs and cats. 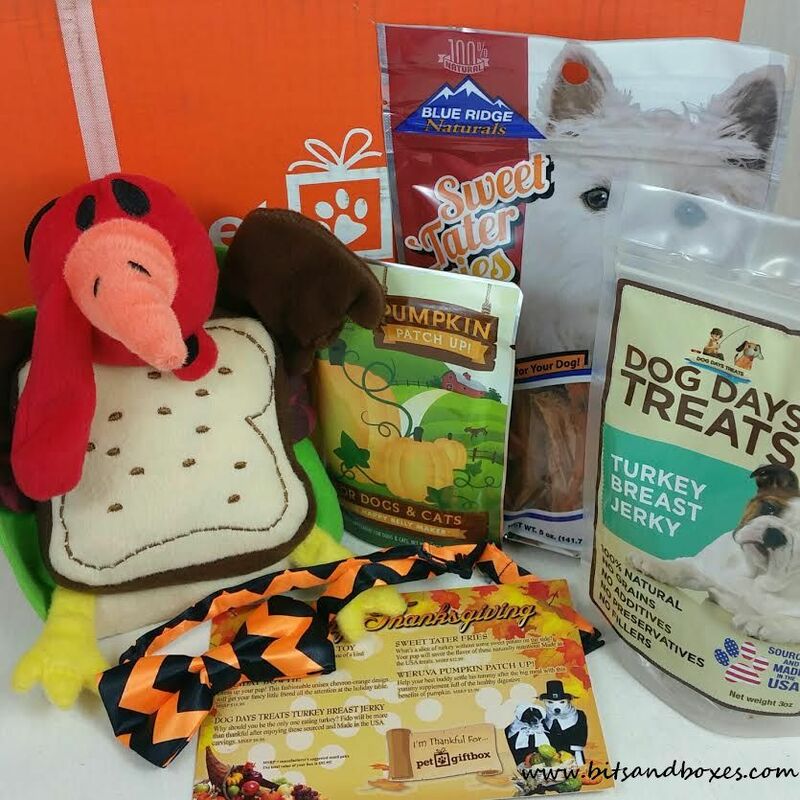 They send appropriate toys and treats every month centered on a theme. This month it's "Thanksgiving," of course! The boxes are curated by pet owners and the toys and treats have been tested on their own pets and been giving the stamp of approval. This review is for the Small Dog box and I really don't recommend it for dogs under 10lbs. While most of the treats would probably be fine, the toys tend to be too big. This is based on my friends' 7lb chihuahua mix. There's just no way she could manage some of these toys. 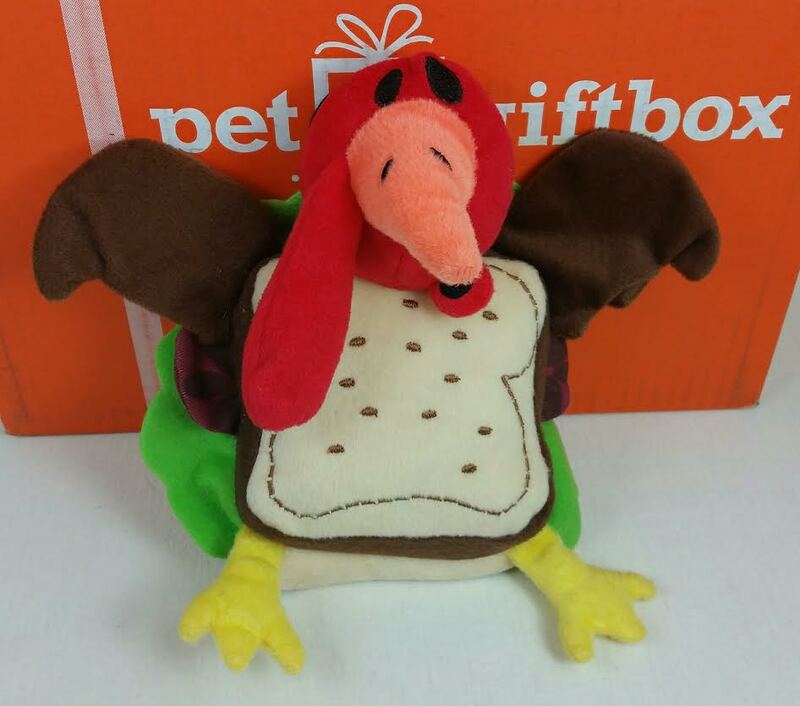 MultiPet Turkey Sandwich- This is a Turkey Sandwich plush that I'm sure will be dismantled nearly immediately. That's usually the case with plush toys like this so it doesn't bother me. Sometimes, though, you never know. Bugsy can get attached and decide not to. Weruva Pumpkin Patch Up- This is pumpkin puree and water in a pouch. I'd be more excited about it if it wasn't made in Thailand. It'd be pretty handing to have smaller batches of pumpkin when the dogs are having stomach issues. Pumpkin is basically magic for that. Holiday Chevron Bow Tie- This seems a little more Halloween than Thanksgiving but it is cute. I'm going to see if I can get one of the boys to wear it without sitting down and not moving from the spot. Do your dogs do that? If I put clothes on my dogs they just stand there, stiff-legged and won't move. So disappointing. Blue Ridge Naturals Sweet Tater Fries- Sweet potatoes are one of Dexter's favorite treats and we haven't had them in a looooong time! I love to give these out when I want the boys to calm down a little. They take some chewing. Made in the US, too. 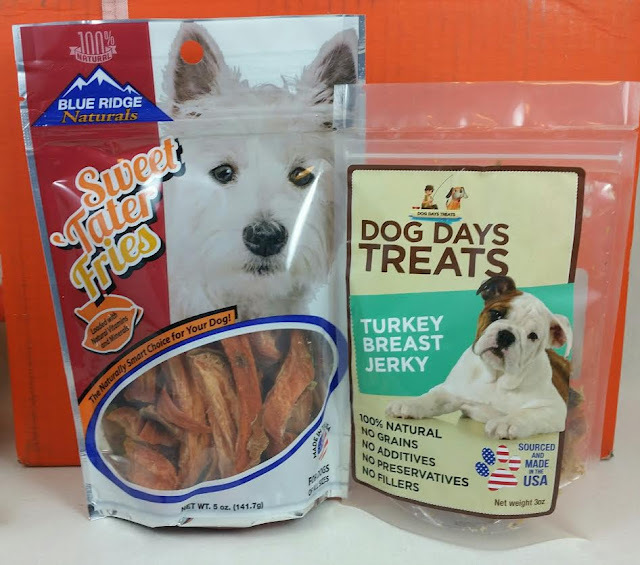 Dog Days Treats Turkey Breast Jerky- Sourced and Made in America, just what I love to see on my dog treats. 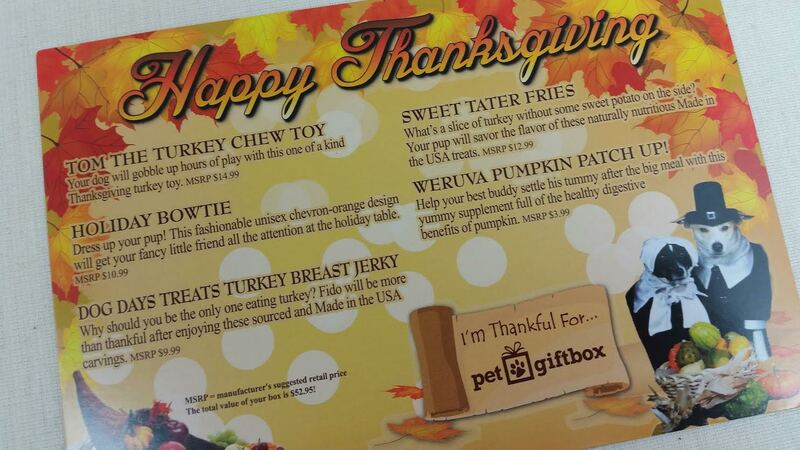 Plus, both dogs can eat turkey! Woohoo! These are going to be great! VERDICT: I'm really happy about the included treats. Both will be enjoyed by the boys, for sure. I'm not too thrilled about seeing a product from Thailand in the mix but the brand seems to be popular at a lot of natural pet stores so it's probably fine. Love the Turkey toy. While I'm not big on clothing in dog boxes, this bowtie is better than a bandana. I still wish it was a toy, though. Drat my dogs and their hatred of clothing. 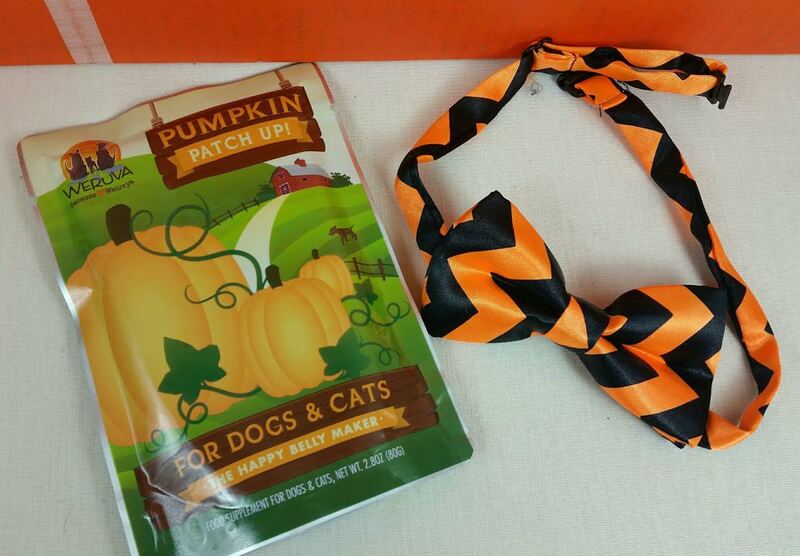 If you would like to sign up for PetGiftBox, you can do that right here. They're having a TON of Black Friday sales so at least sign up for emails. Today you can get 70% off your first box with code PREBLACKFRIDAY (it might not need to be allcaps, though, now that I think about it so try it both ways if allcaps doesn't work). The code is good until 11/24 11:59pm or until the code is used 500 times! If you miss it, keep an eye out for deals tomorrow. That stinks!! I had no idea that it was such a big deal to ship to Alaska and Hawaii until you mentioned how Barkbox started charging $5 to ship to you. Then I started noticing that lots of places like to say "48 contiguous states" and such.